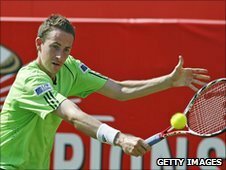 Briton Richard Bloomfield's winning run at the Hall of Fame Championships was ended in the semi-finals by Mardy Fish. The British number 12 was beaten 7-6 (7-5) 6-4 in Rhode Island by the American, ranked 79th in the world. Bloomfield, 27, is currently at 552 in the rankings but is sure to improve significantly thanks to his success at the ATP Tour grasscourt event. Having matched fifth seed Fish in the first set, Bloomfield's serve failed him in game nine of the second. Bloomfield hit faults on eight out of nine serves to gift his opponent the break, and Fish closed out to love to reach Sunday's final. The Englishman said: "It's been a great week, a fun week. I'll remember it forever." Bloomfield's first-round victory over Christophe Rochus of Belgium is under scrutiny after online gambling exchange Betfair reported that the match attracted an unusually high number of wagers. The Norfolk player turned professional in 2002 and was Britain's number four by 2006 before reaching a career-high world ranking of 176 the following year. He has never won a title on the men's tour, and his best singles result at Wimbledon - the only Grand Slam tournament he has played in - was making the second round in 2006. Fish will face Olivier Rochus in the final after the Belgian fourth seed beat Argentina's Brian Dabul 6-3 6-2. The 28-year-old also reached the final of the pre-Wimbledon grasscourt event at London's Queen's Club, where he lost to compatriot Sam Querrey.